Even in the most harmonious relationships, there are differences that set us apart. We may have fundamentally different ideas about how to raise kids, spend money, or handle relationships with friends or relatives. We may have fundamentally different reactions to physical closeness or sexuality. This leads to conflict. 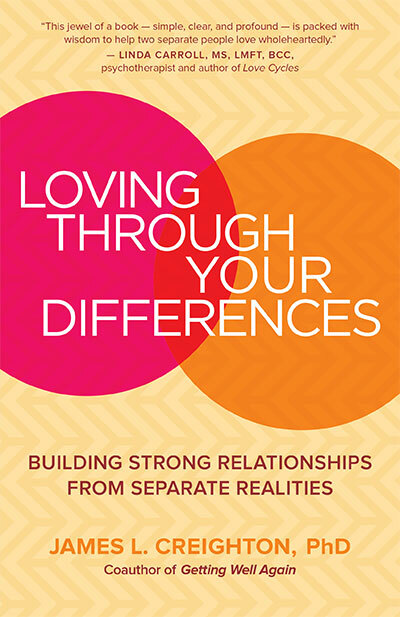 This book empowers couples with the knowledge and skills they need to find excitement and fulfillment, rather than disappointment and frustration, in their differences. Dr. James Creighton has worked with couples for decades, facilitating communication and conflict resolution and teaching them the tools to build healthy, happy relationships. He has found that many couples start out believing they like the same things, see people the same way, and share a united take on the world. But inevitably differences crop up, and it can be profoundly discouraging to find that one’s partner sees a person, situation, or decision completely differently. Although many relationships flounder at this point, Creighton shows that this can actually be an opportunity to forge stronger ties. In Loving through Your Differences, he draws on the latest research in cognitive science and developmental psychology to show how we invent our realities with our perceptual minds. He then provides clear, concrete tools for shifting our perceptions and reframing our responses. The result moves couples out of the fear and alienation of “your way or my way” and into a deep understanding of the other that allows for an “our way.” As Creighton shows, this way of being together, based on the reality of individuality rather than the illusion of sameness, sets the stage for long-term excitement, discovery, and fulfillment. Chapter 1: Whose Reality is Right? Chapter Fourteen: Who’s the Me in This Conflict?